This illustration from Barcelona, 1929, containing many little-known portraits, was published on page 182 of the November 1929 American Chess Bulletin. Are readers able to trace a better/clearer copy? 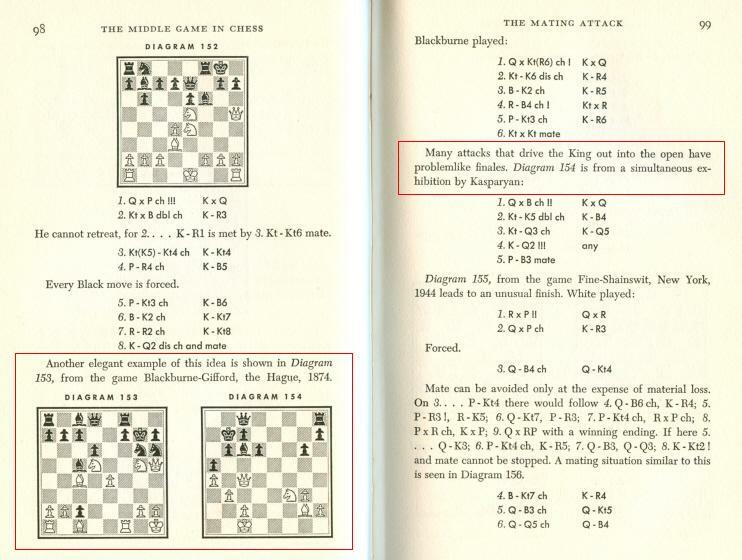 Page 148 of Kings, Commoners and Knaves and page 293 of Chess Facts and Fables discussed the origins of the term ‘Dragon Variation’ in the Sicilian Defence, and the earliest citation we have found comes only from the mid-1920s, on page 43 of the February-March 1925 Tijdschrift van den Nederlandschen Schaakbond. 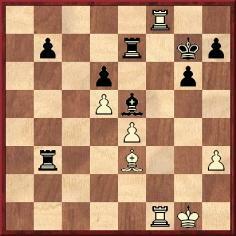 After 1 e4 c5 2 d4 cxd4 3 Nf3 Nc6 4 Nxd4 Nf6 5 Nc3 d6 6 Be2 g6, H. Weenink referred to ‘De “drakevariant” van den Siciliaan’. 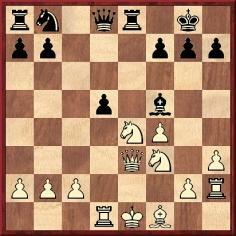 Have other writers used ‘Dragon Variation’ for the pawn advance g2-g4 in the Sicilian Defence? We wonder too how well known the term was in any context during Gromer’s career. 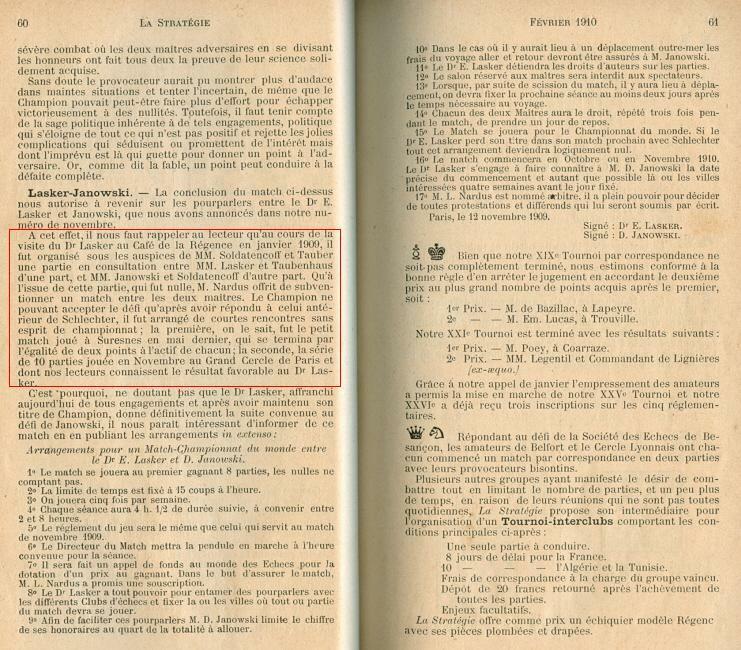 For instance, pages 571-572 of L’Echiquier, February 1927 had a French translation of Kmoch’s annotations to a game (Kostić v Canal, Meran, 1926) which began 1 e4 c5 2 Nf3 Nc6 3 d4 cxd4 4 Nxd4 g6; the note to Black’s fourth move included a reference to ‘La “Drachen” variante choisie ici’, implying unawareness that use was being made of a German term for the Dragon Variation. 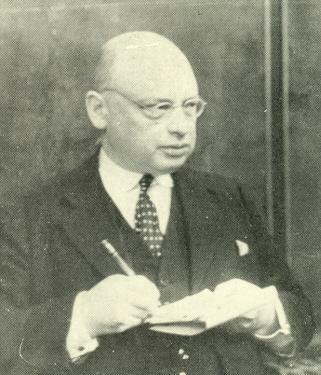 Aristide Gromer (born in 1909) was discussed on pages 175-177 of Chess Facts and Fables, and we still have no information about him from the 1940s onwards. 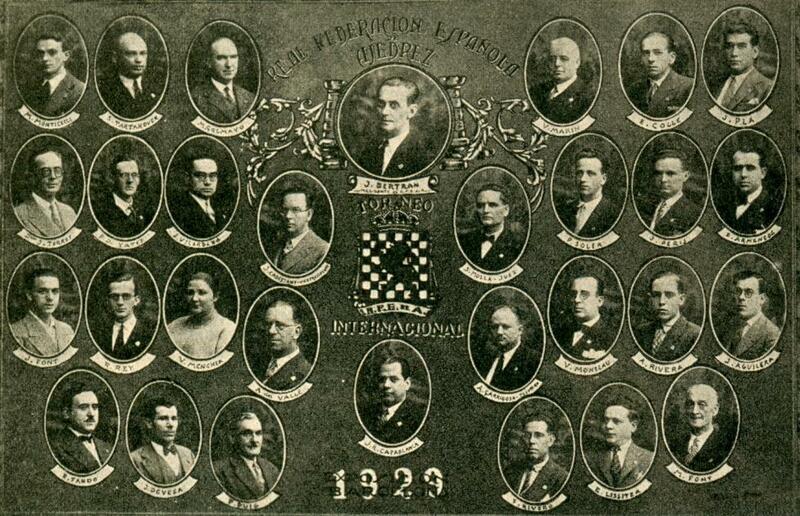 The picture below was published opposite page 80 of El Ajedrez Español, November 1934. Mr I. Gunsberg, who is one of the greatest of living chessplayers, was in Bradford a few days ago, and ... one of our representatives waited upon him, and obtained in conversation the following interesting particulars of his life’s history. Mr Gunsberg is a native of Hungary, and only 33 years of age. When a mere boy of 11 his father taught him the elements of chess, that being at a time when the Hungarian Chess School was represented by such players as Fähndrich, Englisch, Kolisch and Dr Noa. Shortly afterwards young Gunsberg went to live in Paris, where at the Café de la Régence – a renowned chess resort – he encountered the strongest players in the capital. He, of course, received great odds from the recognized masters, such as Rosenthal, Steinitz and Kolisch, but against amateurs he was already able to hold his own, though at this time under 12 years of age. Four years later he was considered “a pawn and two moves” player; that is to say, he received the odds of pawn and two moves from the masters. 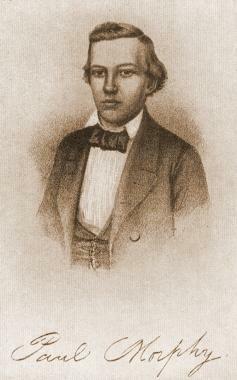 In 1867 he returned to Pesth, his native town, and proved himself to be as good a chessplayer as any of the Hungarians, Schwarz, Englisch and Fähndrich excepted. 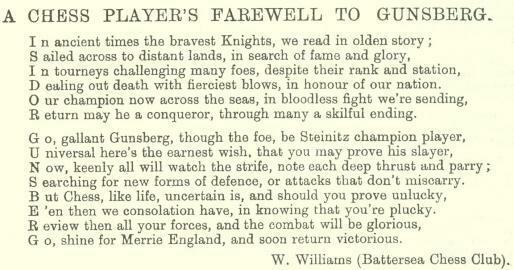 Questioned as to his relations with Steinitz, Mr Gunsberg said he had played one game against Steinitz when the latter was giving a simultaneous performance in 1877, and that he (Gunsberg) lost. 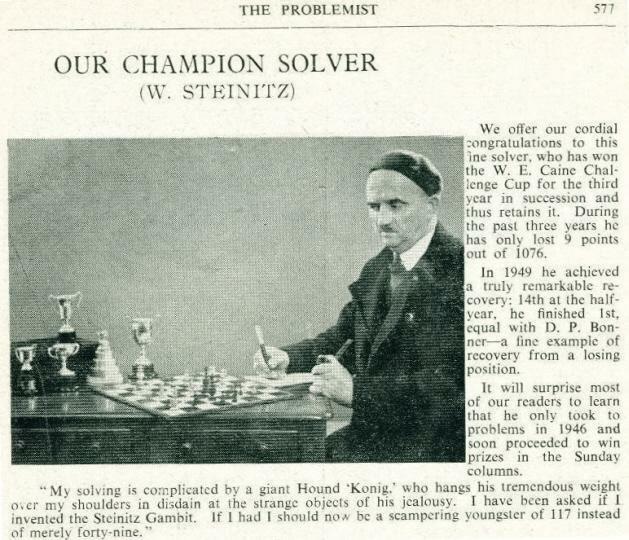 He added that he considered Mr Steinitz undoubtedly the strongest living exponent of the game. He should very much like to play him a match, but not until his play got a little more mature. 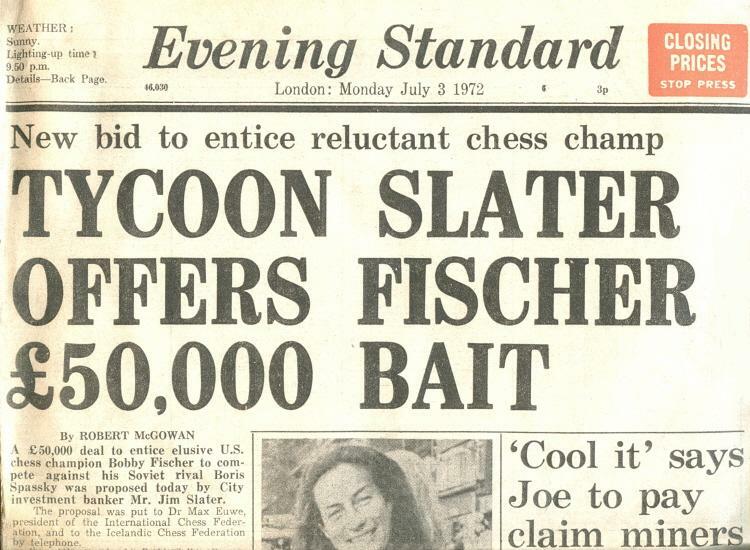 Gunsberg frankly admits that his weakness as a chessplayer is impetuosity in attack, and he observed that when he did undertake to play the champion he should stand a good chance, the natural inference from that statement being that he means to prepare himself for the encounter. 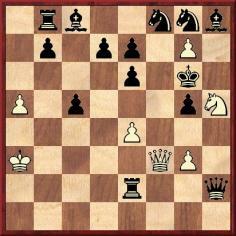 Steinitz is not exactly notorious for friendliness of feeling toward other noted chessplayers. Regarding this point Gunsberg says he met Steinitz frequently for years, and was on friendly terms with him, but he doubts whether the champion would still feel inclined to be very amiable to him, though his own feelings towards him are unaltered. The conversation turned at length upon the forthcoming International Congress at Bradford. Judging from the great variety of events, he thinks this congress will be the finest provincial chess meeting ever held. Up to the present time, he said, only Germany has been able to arrange successful provincial gatherings of so extensive a kind. In no other country have chessplayers ever succeeded in having a meeting of such importance outside the capital. He declined to prophesy as to the probable winner of the Masters’ Tournament, but has sufficient confidence in himself to express the opinion that his chances are as good as those of anybody else. He is in very fair form at present, but, as everybody knows, is very liable to sudden physical depression. 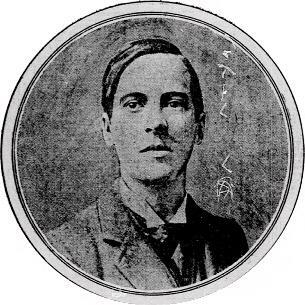 The following month Gunsberg won the Bradford tournament, ahead of Mackenzie, von Bardeleben, Mason, Burn, Blackburne and Weiss. A further question is why Gunsberg’s forename was, during his lifetime, so often given as J., rather than I. To quote just one late example, the Marienbad, 1925 tournament referred to ‘J. Gunsberg’. This is George Allen (1808-76), in a picture published opposite page 22 of Chess in Philadelphia by Gustavus C. Reichhelm (Philadelphia, 1898). Further to G.H. Diggle’s reference to Savielly Tartakower in C.N. 4331, Hassan Roger Sadeghi (Lausanne, Switzerland) asks if more information is available about Tartakower’s service in the Fighting French Forces during the Second World War under the pseudonym ‘Cartier’. ‘It might perhaps surprise those who do not know him that at the age of 53 the learned doctor was actively engaged in the battle against Hitler and that, after having been decorated for gallantry in the First World War whilst fighting for Austria, he should now have been just as hotly and bravely engaged on what might be termed the other side. But he has always regulated his behaviour on strict principles of right and wrong. Nothing will ever deter him from embarking on a course which he thinks to be his duty. 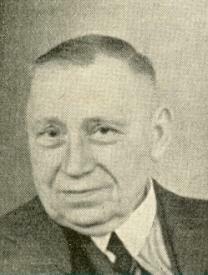 In all, the BCM published about a dozen games by Lieutenant Cartier during the War. The match described by G.H. Diggle took place in London on 22 April 1944 and was reported on pages 107-109 of the May 1944 BCM. 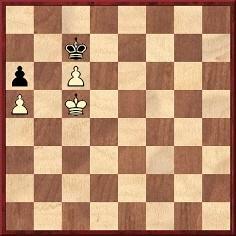 His opponent was G. Wood. The pseudonym ‘Cartier’ was no secret; for instance, page 268 of the December 1942 BCM referred to ‘Lt. 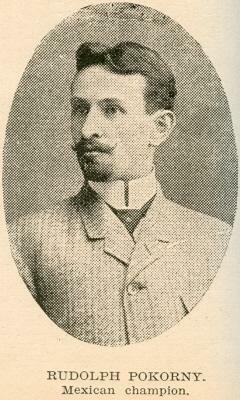 G. Cartier of the Fighting French, better known in the chess world as Dr Tartakower, the great international’. We still seek substantiation of the claim that Tartakower was several times ‘dropped by parachute behind enemy lines on secret missions’ (see page 331 of Kings, Commoners and Knaves). More generally, what else is known about Tartakower’s activities during the Second World War? 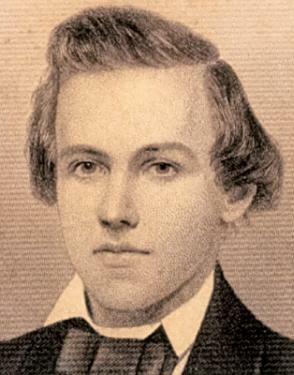 Javier Asturiano Molina (Murcia, Spain) requests details regarding Paul Morphy as a problem composer. In a letter (date not mentioned) to G. Reichhelm, who was the chess editor of the Philadelphia Sunday Times, General John Tillson discussed a chess problem composed by Morphy before attaining the age of ten. 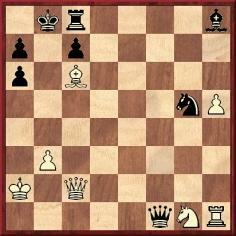 In Morphy’s Games of Chess P.W. Sergeant called it ‘Morphy’s Alleged Problem’ and noted that Alain C. White had cast doubt on its authenticity. After giving the problem, as above, Lawson quoted Charles Maurian in the New Orleans Times Democrat of 12 October 1884. Maurian was inclined to believe that it had not been composed by Morphy. 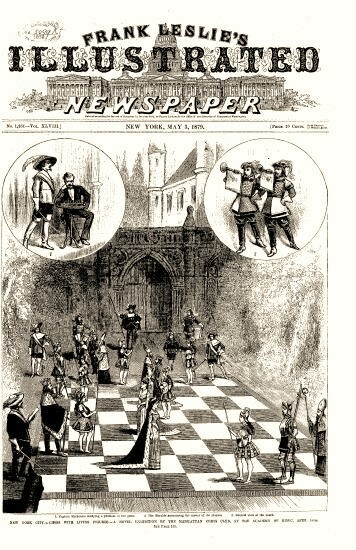 Lawson then stated: ‘Unquestionably it is Morphy’s chess problem and his only one.’ He pointed out that on 10 June 1856 Ernest Morphy sent it to the New York Clipper, where it was published on 28 June. 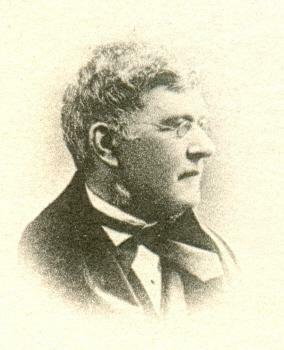 In addition, Sam Loyd gave it in the New York Musical World of 30 April 1859. 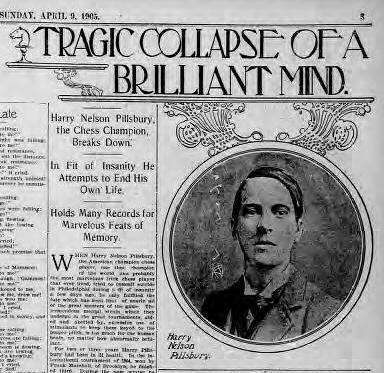 On page 11 Sergeant specified the chronology: after Reichhelm gave the problem in the Philadelphia Times in 1887 Tillson wrote to him about Morphy’s young age at the time of composing it. It would seem, though, that Sergeant’s source was merely the (1920) republication of the story, and that he did not have the Philadelphia Times of 1887. Can any reader provide that earlier text? Can anything further be discovered as to how Morphy’s name became attached to Cook’s composition? 5142. A column by Marshall? 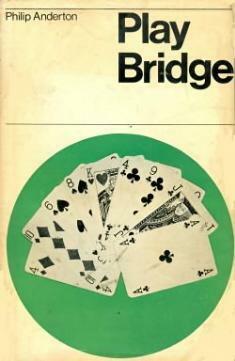 To our brief list of authors of books on both chess and bridge (G. Abrahams, A. Chéron, Em. Lasker and J.C.H. Macbeth) we add a fifth name: Philip Anderton. 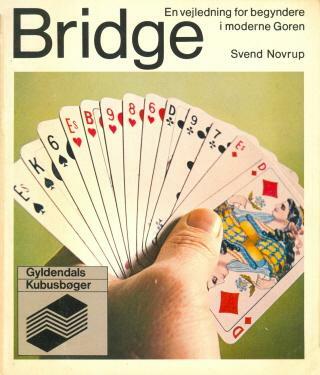 In addition to Bridge in 20 Lessons, Contract Bridge Simplified and Play Bridge he brought out A Basic Chess (London, 1955). A short work with an ungainly title, A Basic Chess was notable for its unusual notation. To quote a gamelet from page 32: (1) 26-36 75-55 (2) 27-47 84-48 mate. Is information available about Philip Anderton? Books continue to claim, without substantiation, that the title of ‘grandmaster’ was first conferred by Tsar Nicholas II at St Petersburg, 1914. The matter was discussed on pages 315-316 of Kings, Commoners and Knaves and pages 177-178 of A Chess Omnibus, and we have still found no earlier occurrence of the story than in an article by Robert Lewis Taylor in The New Yorker, 15 June 1940. To pose a broader question: do 1914 sources contain references to Tsar Nicholas II in connection with any aspect of the St Petersburg tournament? 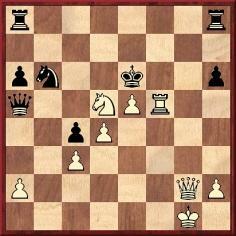 37...Rxg5 38 R1f7+ Rxf7 39 Rxf7+ (‘Forcing stalemate or perpetual check.’). 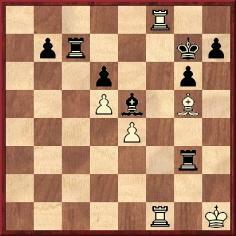 Abrahams did not name the players, but the position after White’s 37th move was given on page 346 of the September 1929 BCM. W.A. Fairhurst was White against T.H. Tylor. For similar deeds, see the entry for ‘Cunning, gamesmanship and skulduggery’ in the Factfinder. 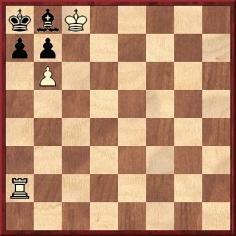 ‘It was an artistic gem of the chessboard. Nimzowitsch is an artist. No-one appreciates beauty or perfection more than he. His own artistry has often dumbfounded opponents less skillful. But against the champion – that’s something different again. Once more, that straitjacket; that is, the chessic kind. 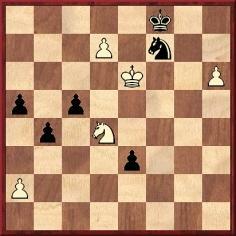 ... His little army was precisely as large as Capablanca’s. But he was cramped and he ached for elbow room. As to space and mobility he was much restricted. No matter which way he looked there was restraint. The prospect was decidedly irksome. Very expressive is the German term of “Zugzwang”. It covers the case exactly. Literally translated it means move-coercion. The player thus unfortunately placed may be said to be position-bound. Gradually all his available moves are exhausted; that is, the moves that count at all. Then he faces the inevitable. C.N. 5090 discussed the origins of the dictum ‘Counter-attack is the best form of defence’. We quoted ‘La contre-attaque est une excellente manière de se défendre’ on page 51 of Nouveau manuel illustré du jeu des échecs by J.A. de Rivière (Paris, 1892), noting that, since it was not the first edition of the book, it might well be possible to trace the idea further back. Vasco Resende (Le Mans, France) now confirms that the identical passage appeared in the original edition (undated, but published in Paris in 1860 or 1861). 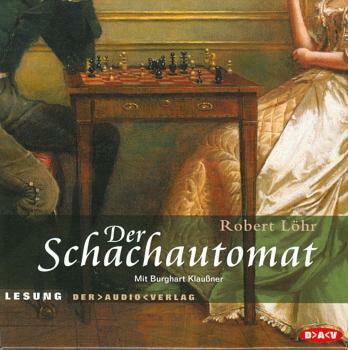 Recommended for German speakers: Burghart Klaußner’s fine reading of Robert Löhr’s novel about Wolfgang von Kempelen’s invention, Der Schachautomat (five CDs produced by Der Audio Verlag GmbH). Concerning the book itself, we note from the dust-jacket of the English edition, The Chess Machine (New York, 2007), that ‘the rights have been sold in more than 20 countries’. Kasparyan v Manvelyan, simultaneous display, USSR, 1936. 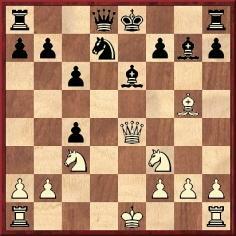 White won with 1 Rxc6 Bxc6 2 Qc4+ Kb7 3 Qxc6+ Kxc6 4 Ne5+ Kc5 5 Nd3+ Kd4 6 Kd2 Qe6 7 c3 mate. 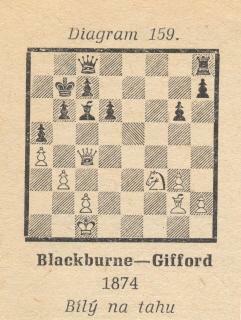 The Blackburne and Kasparyan positions are presented by Fine side by side, which may have resulted in his reference to ‘Blackburne-Gifford’ being misread as relating to diagram 154, instead of 153. That still leaves two discrepancies, however. Firstly, whereas Fine stated that the game was played in the Hague (which is confirmed by, inter alia, page 154 of P. Anderson Graham’s book on Blackburne), Zinser placed the game in England. 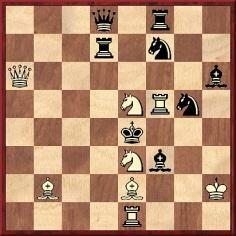 Secondly, Black’s king’s-side units in Fine’s diagram are omitted by Zinser. It is, of course, possible that these divergences were introduced elsewhere by another writer (i.e. after Fine and before Zinser). We still lack definitive information about the Kasparyan position, which has been published over the years with varying details, though never, it seems, with the full game-score. Is a good, solid source from the 1930s available? 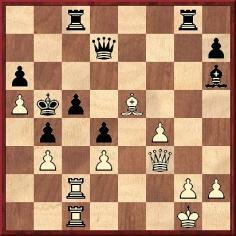 26...f3 27 Rxh4 fxe2+ 28 Kxe2 Bd4+ 29 Re4 Rf2+ 30 Ke1 Rxe4+ 31 dxe4 Bxc3 32 Bxc3 Rxg2 33 White resigns. 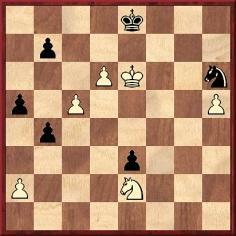 This ending is usually published in books with the caption ‘Fahrni-Alapin’ (see pages 42-43 of A Chess Omnibus), but we are grateful to Anssi Korhonen (Helsinki) for pointing out that the position appeared in Emanuel Lasker’s Common Sense in Chess. Depending on the edition, the page numbers are 108-110, 108-109 or 126-127. The first of these references relates to the original edition of 1896. 1 K-Q5 K-B 2 K-B4 K-Q 3 K-Q4 K-B 4 K-Q5 K-B2 5 K-B5. 17 Rxd5 Qxd5 18 Nf6+ gxf6 19 Qxe8+ Kg7 20 g4 Bd7 21 Qe3 Nc6 22 Rd2 Qa5 23 Kf2 Re8 24 Qd3 Be6 25 a3 Qb6+ 26 Kg2 Qxb2 27 f5 Bc8 28 Qb3 Qxb3 29 cxb3 Re3 30 Rd3 Rxd3 31 Bxd3 Ne5 Drawn. In that blindfold display Pillsbury played simultaneously eight games of chess (+5 –0 =3) and four of checkers (+0 –1 =3). The same column gave the ending of the Pillsbury v Guthrie draw, whose full score appeared (although only with the heading “USA 1904”) on pages 273-274 of Jacques N. Pope’s book on Pillsbury. 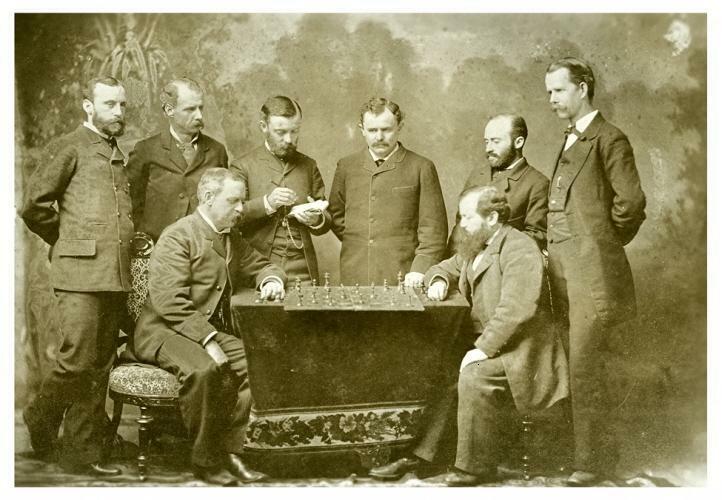 That game occurred in a second display at the Washington Chess Club on 14 November 1903 (19 chess games and seven games of checkers, played simultaneously but not blindfold). 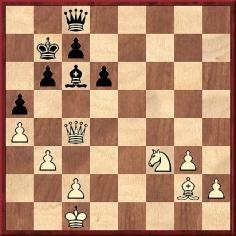 That column of 21 November 1903 also included the scores of two checkers games by Pillsbury, against F.E. Potts and Paul F. Grove. Source: Washington Times, 21 November 1903, page 8. For readers’ convenience we have converted the score from ‘11-15 22-18’, etc. to the algebraic notation. 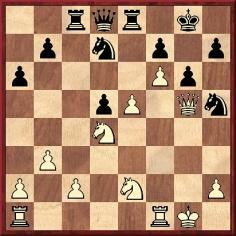 Regarding Janowsky’s alleged use of ‘blind swine’ to describe two rooks on the seventh rank, James Stripes (Spokane, WA, USA) points out that the attribution appeared in V. Vuković’s book The Art of Attack in Chess; see, for instance, page 73 of the 1993 edition published by Cadogan Chess. 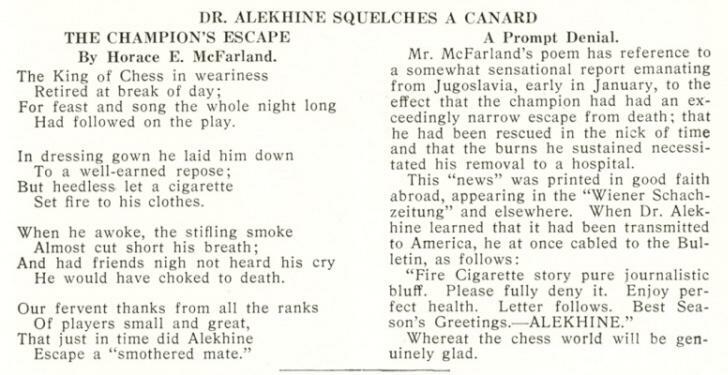 Our correspondent cites two games in which Janowsky could only draw despite having his rooks on the seventh rank: his tenth match-game against Showalter in New York, January 1899 (American Chess Magazine, February 1899, pages 360-361) and his first-round encounter with Marshall at New York, January 1913 (American Chess Bulletin, March 1913, page 54). 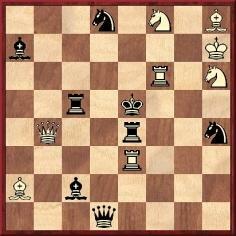 After 31 Bc7 Black resigned. It is strange how often, nowadays, this game is merely labelled ‘Tarrasch v the Allies’, as if the identity of the losers were unknown. They were D. Marotti, E. Napoli, de Simone and del Giudice, as is shown by such sources as pages 120-121 of Deutsches Wochenschach, 5 April 1914 and pages 180-182 of Schachjahrbuch für 1914 II. Teil by L. Bachmann (Ansbach, 1914). The four names were also given by Tarrasch when he annotated the game (played at the Circolo Artistico in Naples on 9 March 1914) in the Berliner Lokal Anzeiger; those annotations were reproduced on pages 162-163 of La Stratégie, April 1914. 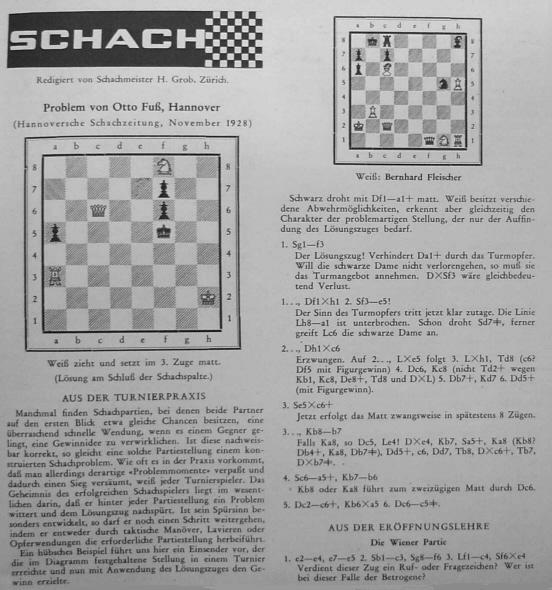 The names also appeared when the game was presented on pages 398-399 of Tarrasch’s book Die moderne Schachpartie (Leipzig, 1924) and on pages 168-170 of Tarrasch’s Schachzeitung, March 1934 (published after his death). In these last two sources ‘Gindice’ was given instead of Giudice. 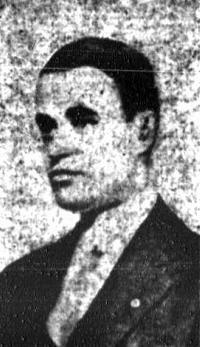 The strongest of the allies was Davide Marotti (1881-1940), who became Italian champion in 1921. At the 1921 Italian championship, held in Viareggio, one of the participants was M. Romi(h), and Javier Asturiano Molina (Murcia, Spain) asks about the spelling of his name. Has any writer already sorted out the (rather complex) details? The entry on pages 433-434 of the Dizionario Enciclopedico degli Scacchi by A. Chicco and G. Porreca (Milan, 1971) merely had ‘Romi Max’, whereas page 359 of Jeremy Gaige’s Chess Personalia (Jefferson, 1987) gave ‘Romi, Massimiliano né Romih, Max’. The index (page 631) of Storia degli Scacchi in Italia by A. Chicco and A. Rosino (Venice, 1990) put ‘Romi (Romih), Massimo (Max)’. Our correspondent, Javier Asturiano Molina, comments that the Romi/Romih spelling question is relevant to the well-known ‘spiritualist’ yarn about a game between Maróczy and Korchnoi, widely discussed on the Internet and elsewhere. 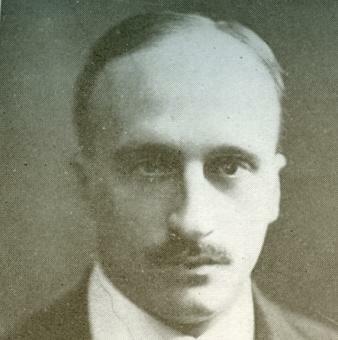 It may be recalled that, as a test question, the ghost of Maróczy was purportedly asked whether he recognized the name ‘Romi’. The answer that came back was negative, although he did recall having, in 1930, an opponent named ‘Romih’. 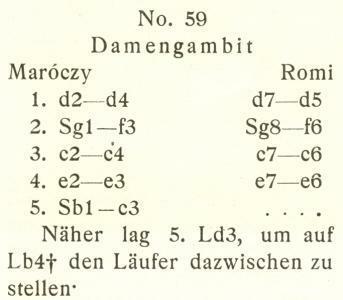 The start of Maróczy’s annotations in Kagans Neueste Schachnachrichten, June 1930, pages 179-181. From page 35 of Maróczy’s 1951 book A megnyitások elmélete. The above is reproduced from volume two of Taktika Moderního Šachu by L. Pachman (Prague, 1964). See also page 76 of the German edition (Moderne Schachtaktik, volume two) and page 64 of the Spanish translation (Táctica moderna en ajedrez, volume two), as well as page 49 of Attack and Defence in Modern Chess Tactics (London, 1973). Biographical details about Gifford are still being sought. A rare instance of his being named as ‘Birkmyre Gifford’ occurred on page 109 of the April-May 1879 issue of La Stratégie. ‘I should like to obtain biographical facts about William Harris, who was mentioned in your article on Alexander McDonnell. He seems to have been unusually enthusiastic about chess, judging from his occasional contributions to the Chess Player’s Chronicle in its early years. 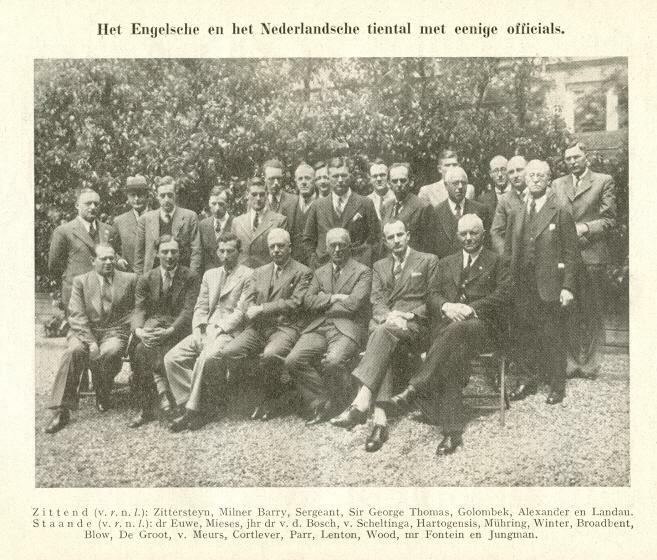 The occasion was the match between Holland and England in the Hague, 28-29 May 1939. 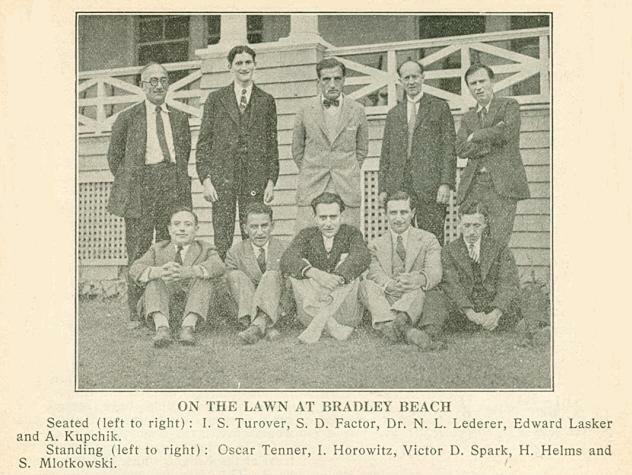 This photograph was published on page 54 of the March-April 1940 American Chess Bulletin. The reference to Rueb is rather surprising. The report in the Wiener Schachzeitung (on page 374 of the December 1930 issue) was nearly 40 lines long. 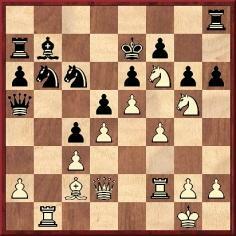 12...Nc5 13 Qh4 Nd3+ 14 Ke2 Qc7 15 Ne4 h6 16 Bf6 Nf4+ 17 Kf1 Ng6 18 Qh5 Bxf6 19 Nxf6+ Ke7 20 Ne4 b6 21 Re1 Rad8 22 Nh4 Nxh4 23 Qxh4+ Kd7 24 g3 Kc8 25 Kg2 Bd5 26 f3 Bxe4 27 Qxe4 Rd2+ 28 Re2 Drawn. Biographical information about him is still being sought. Source: New York Sun, 8 May 1910, third section, page 10. 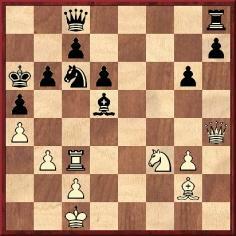 An unusual mate in three was available at the end: 33 Qg6+ Kxd5 34 Rf6, etc. Concerning the feature article on Edward Lasker v George Thomas we now note that Lasker also published the game on pages 216-217 of the second edition of his book Schachstrategie (Leipzig, 1914). Remarkably, this yields a ninth version of the first nine moves: 1 d4 f5 2 Nf3 e6 3 Nc3 Nf6 4 Bg5 Be7 5 Bxf6 Bxf6 6 e4 fxe4 7 Nxe4 b6 8 Ne5 O-O 9 Bd3 Bb7. 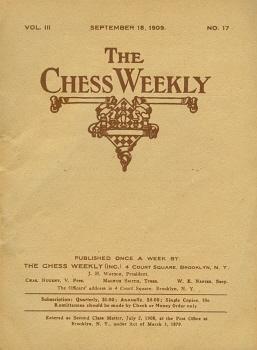 In the table of contents (page viii) the game was mysteriously dated 1904. 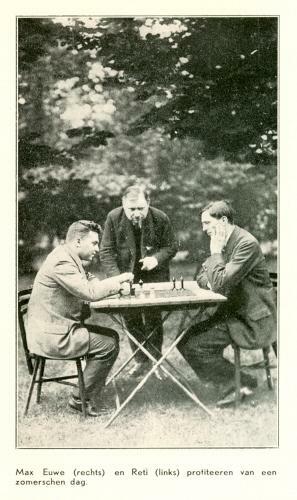 The game-score was not included in Lasker’s Chess Strategy (London, 1915), which was based on that second German edition. 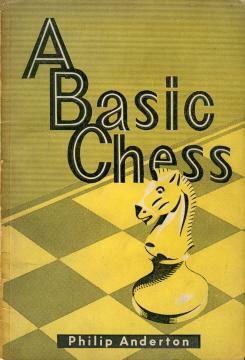 ‘I believe my book Chess Strategy, the sale of which (between 40,000 and 50,000 copies) exceeded that of any other chess book, achieved its success solely because for the first time it offered the student a real theory of the game which they could apply to any position, according to their more or less thorough grasp of the general strategic principles explained in the book. I remember that in reviewing that book the great Schlechter, with whom Emanuel Lasker had just barely drawn his match for the world championship, called the teaching method I employed so superior to any used previously that he hoped it would be adopted by all future chess authors. This honor of imitation has indeed been conferred upon me by most authors who later wrote again on chess strategy or tactics, including Capablanca and Nimzowitsch, the former doing it in a more superficial, the latter in a more profound, manner. At any rate, books which offered a theory consisting of opening collections became a matter of past history. We saw the above position on page 120 of Winning Chess Tournaments by Robert M. Snyder (Lincoln, 2007), with the caption ‘Fleischer versus Amateur, Switzerland, 1938’. 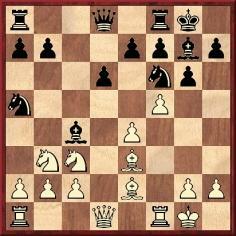 Preventing ...Qa1 mate, White played 1 Nf3 Qxh1 2 Ne5, attacking the queen and threatening mate on d7. Richard Forster (Zurich) informs us that the combination was published by Henry Grob in his weekly column in the Zürcher Illustrierte Zeitung (24/1940, page 645). 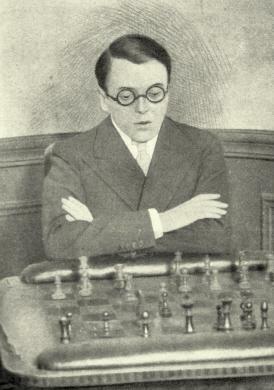 White was named as Bernhard Fleischer, but no date or place for the game was given. Nor do we have the complete score. 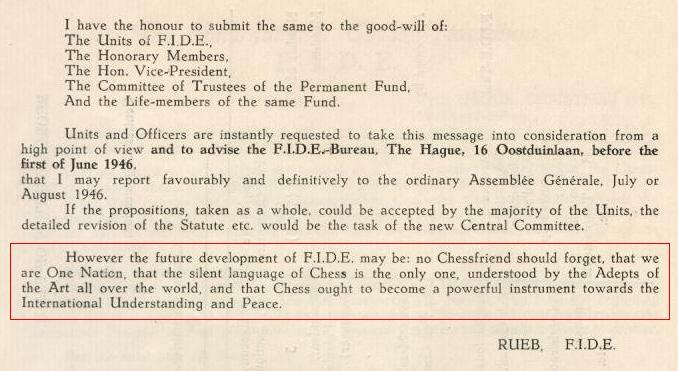 Information is still required on when FIDE adopted the Latin motto Gens una sumus. As mentioned in C.N. 4364, the earliest occurrence in print known to us is surprisingly late: FIDE Revue, 1952. Mr Wright notes that Potyomkin (or Potemkin) participated in the unofficial FIDE Olympiad in Paris in 1924 and that he died in 1926. What more is known about his claimed connection with Genus una sumus? A chronology by Dr John van Wyhe of Cambridge University records that John Elliotson and J. DeVille were founding members of the London Phrenological Society in 1823. 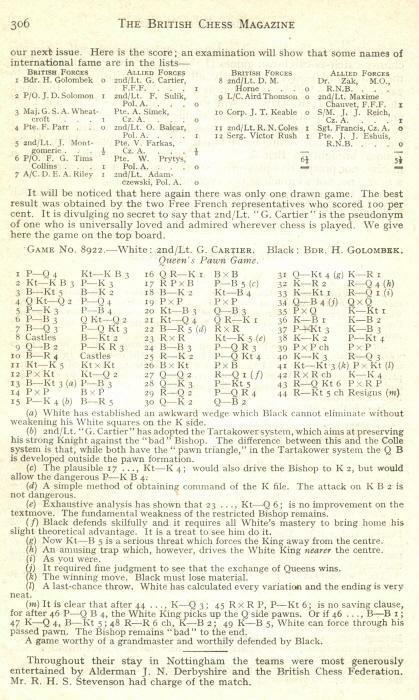 A very early appearance of the name ‘Morphy’ in a chess magazine came on page 248 of Le Palamède, 15 May 1842. It was, however, a reference to Ernest Morphy (Paul’s uncle). 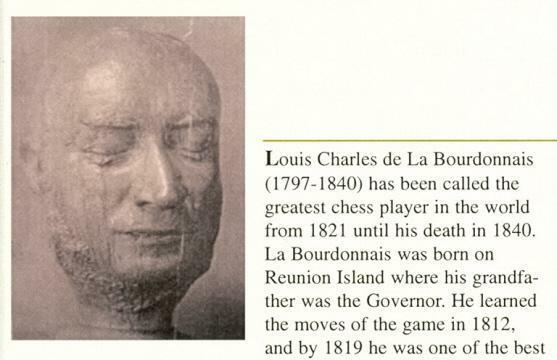 A feature on chess in the United States mentioned the devastation caused by yellow fever in New Orleans, and stated that Ernest Morphy (‘notre correspondant’) was active in chess there and had sent highly interesting material to Labourdonnais. 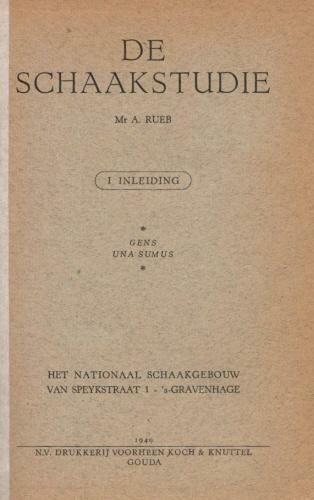 Peter de Jong (De Meern, the Netherlands) reports that there are several references to H.W.B. Gifford in 150 jaar DD (The Hague, 2005), and particularly on pages 29-31, in an article by S.Th. Hogers and W.J.P. Vink. Gifford, an Englishman, was a member of the DD (Discendo Discimus). He won the first unofficial Dutch championship, in the Hague in 1873, moved to Paris in 1877 and, as mentioned in C.N. 5156, participated in the following year’s tournament there (defeating Anderssen). The book also notes that Gifford was a composer. His birth and death details have yet to be established. In response to C.N. 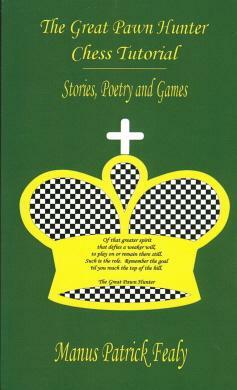 4961, which invited examples of the worst chess poems, Avital Pilpel (Haifa, Israel) mentions The Great Pawn Hunter Chess Tutorial (subtitle: Stories, Poetry and Games) by Manus Patrick Fealy (Bloomington and Milton Keynes, 2006). There are indeed many spectacularly unprintworthy specimens in what is, of course, yet another ‘vanity press’ production. In earlier, happier, days, such material might merely have been chalked on the pavement. What more is known about that initiative? Source: Časopis Českých Šachistů, 9/1913, page 140. 5187. Réti, Euwe and who? Can any reader identify the third man in this photograph, which comes from Aljechin-Euwe by Guus Betlem Jr (Helmond, 1936)? 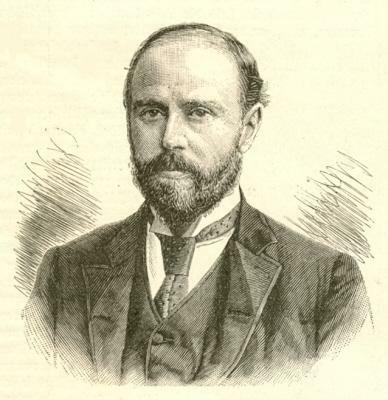 Page 20 of Les échecs par la joie by Aristide Gromer (Brussels, 1939) asserted that Ruy López was Montaigne’s cousin. On what grounds? 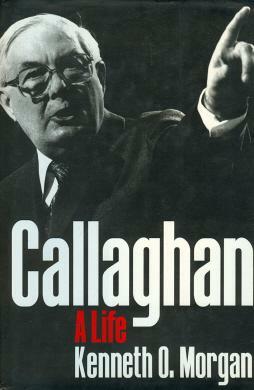 A note on page 134 refers readers to pages 26-27 of the June 1990 CHESS for Lord Callaghan’s interview with Cathy Forbes. She reproduced it on pages 141-147 of her book Meet the Masters (Brighton, 1994). 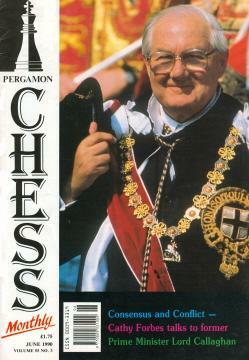 See also CHESS, April 1993, pages 4-9. 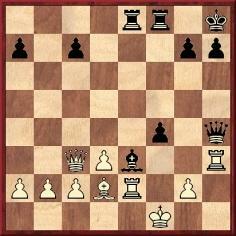 5 Kf6 e2 6 h7 e1(Q) 7 d8(Q)+ Qe8 8.Ne6 mate. 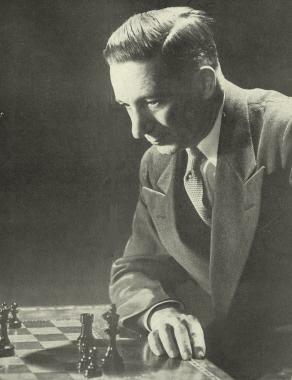 Christian Sánchez (Rosario, Argentina) notes that the Kasparyan position was published as ‘Kasparyan-Manvelyan’ on page 231 of Chess Review, November 1939. Can earlier appearances be found? 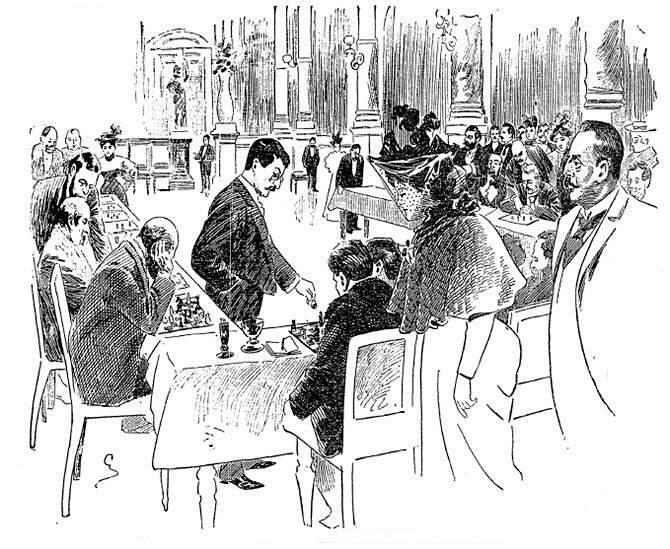 Our correspondent adds that the caption was ‘Lasker, the chess expert, playing several games at the same time at the Kaiserhof, Berlin’, it being specified that the drawing was taken from Zur Guten Stunden. Published in 1988 by colección Ricardo Aguilera (Madrid), Morphy su vida y 353 partidas by Benito López Esnaola claimed to be an important work of scholarship. As noted in C.N. 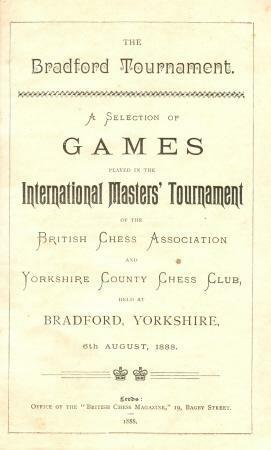 1821, the author commented in his introduction: ‘Morphy’s games have been compiled before, but I believe that the present book breaks the record with 353. The previous total was 300.’ The back-cover blurb remarked that 353 was a ‘record figure’ and trumpeted López Esnaola as ‘an excellent investigator of chess history’. Our earlier item mentioned that such words were considerable exaggerations. 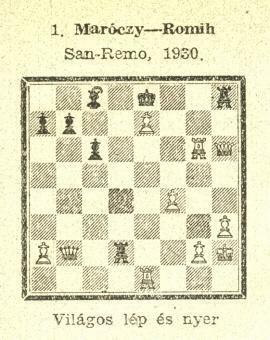 Maróczy’s book on Morphy (first published in 1909) contained over 400 games, even though López Esnaola mentioned this predecessor on page 26. On the other hand, he overlooked the second series of unknown Morphy games published by David Lawson in the BCM (September 1979), and showed no evidence of acquaintance with Paul Morphy The Pride and Sorrow of Chess. There were so many misspellings they could hardly be printers’ errors. Pages 18, 26 and 35 referred to the ‘Britisch Chess Magazine’, no doubt by analogy with the ‘Britisch Chess Review’ (page 172). Staunton’ column was in the ‘Ilustration London’ (page 14), the ‘Ilustrated London News’ (pages 15, 16 and 172) and the ‘Ilustrated London’ (pages 17 and 18). Other nineteenth-century revelations were ‘McConnel’, ‘Rouseau’, ‘La Bourdonais’, ‘Lichtenthein’, ‘Lichtentheim’, ‘Lichtenheim’, ‘Lyttleton’, ‘Lytleton’, ‘Harwitz’, ‘St Jame’s Chess Club’, ‘Ilustrated Sportin and Dramatic News’, ‘MacDonnel’ , ‘Zukertot’ , ‘Andersen’, ‘Cuningham’, ‘Sucre’, ‘La Palamede’ and ‘Delandy’. In addition, López Esnaola’s book concluded with six pages of biographical notes on Morphy’s opponents. They were simply purloined from the footnotes in Morphy’s Games of Chess by P.W. Sergeant. ‘Return to Find Partner Gone. Business Associates Accuse Rudolph Pokorny of Appropriating Funds While They Are on Vacation. ‘Thus he is the same Rudolph Pokorny who was given to ridiculous puffery for his hair-styling in a Tribune article of 17 June 1906. 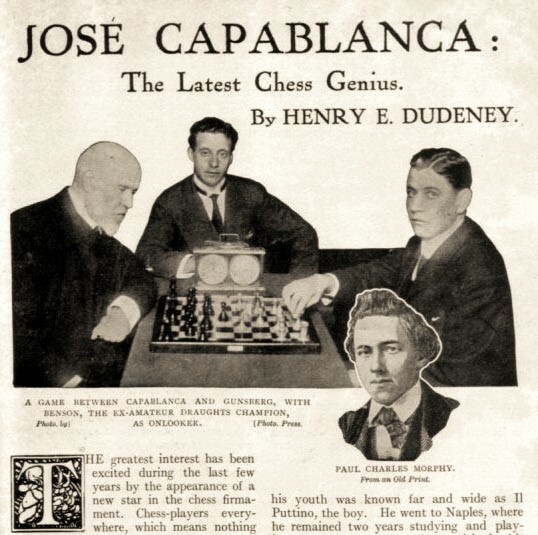 Any doubt that the Chicago Pokorny and the Mexican Pokorny are the same is dispelled by Uedemann’s column of 1 August 1909; along with his challenge to Capablanca, Pokorny challenged his old Chicago club to a correspondence match. Both “Rudolf” and “Rudolph” were used in advertisements for Pokorny’s hair salon. 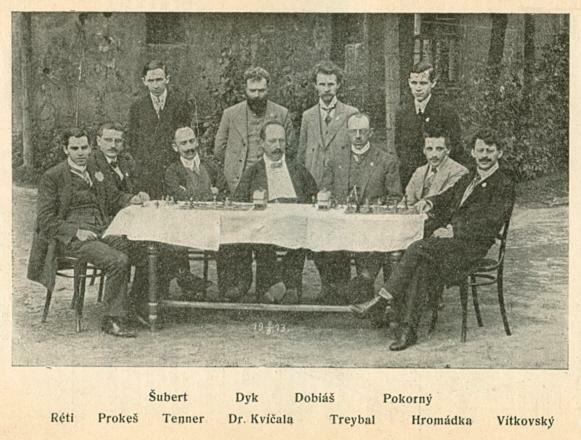 Strangely, the only mention I have of a Pokorny in Chicago chess (no first name is given) is in Uedemann’s column of 8 December 1907, which said that he had played in a consultation match the previous Monday. This would seem odd, since it would put him in public in Chicago after he absconded with the money. a) In many magazines the idea of the match being for the world championship is simply not mentioned (e.g. BCM pages 483 and 543). b) Others are specific that the title was not at stake (e.g. Deutsches Wochenschach und Berliner Schachzeitung page 382, Tijdschrift van den Nederlandschen Schaakbond page 253). The match was played in Paris, so it is no surprise that French-language magazines are especially precise in refuting any world championship connection (e.g. La Stratégie pages 352 and 407, and Revue d’échecs page 214). Further details were given in C.N. 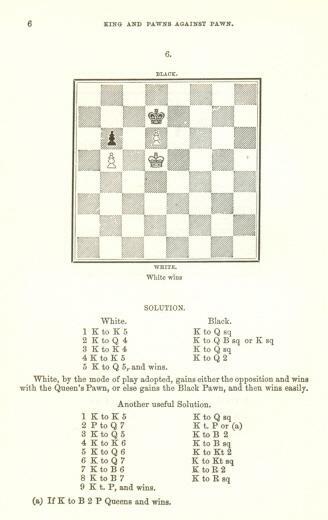 2471 (see page 174 of A Chess Omnibus), as reproduced below. Lasker survived against Schlechter, and in Berlin on 8 November 1910 there duly began the one and only world championship match between Lasker and Janowsky.